What is that metallic taste in my mouth? If you've ever had a metallic taste in your mouth after a meal, you may have experienced Dysgeusia. Dysgeusia is an altered sense of taste that often leaves your mouth feeling as if you have just finished eating a meal containing coins. There are many reasons as to why one experiences this and most of which are not a cause for concern. • Antibiotics, anti-thyroid as well as neurological drugs are few medications that may cause Dysgeusia. • People undergoing chemotherapy and radiation. • Those recovering from surgeries where anaesthesia is used may experience Dysgeusia during and after treatment. • People suffering from neck and head cancers, Parkinson's disease, Diabetes and Gastroesophagel Reflux disease may experience this. • Smoking or having poor dental hygiene may also cause Dysgeusia. • Deficiency in vitamins and minerals like B12 or zinc, or even an overdose of a nutrient, dietary supplement or food containing potentially toxic ingredients. • Clupetoxin poisoning is a fatal condition that not only causes one's mouth to taste like metal but also cause the individual to become violently ill. This occurs after consuming plankton-eating fish such as bonefish, sardines, herring, and tarpons that have ingested the toxin. 50% of cases of Clupetoxin poisoning result in death. 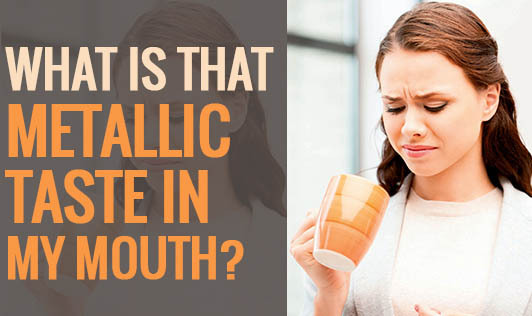 Majority of the causes of a metallic taste are easily treated, but if the condition is persistent, it's very important to see a doctor for a diagnosis.